This morning as I was hurrying to take my train from Union Station, a lady was coming the opposite side and asked me “where is the train to San Diego?” I pointed her in the right direction but Ughhh! I wanted to hop on that train! I thought about it briefly “I can go the way I am right now..No, I need to go to work…I’ll get updates from there :-(. I hope Padilla gets better support from the offense. 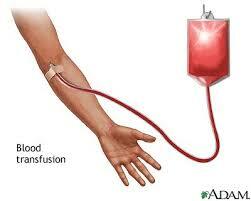 Our offense has been so anemic that they need one of these. Dodgers acquired Podsednik for Class A RHP Elisaul Pimentel and Catcher Lucas May. Not happy that Oswald went to the Phillies. Dodgers have not even faced the Phillies yet. The Wild Card just got a little harder and wilder. Will the Dodgers be buyers or sellers by the Trade deadline? 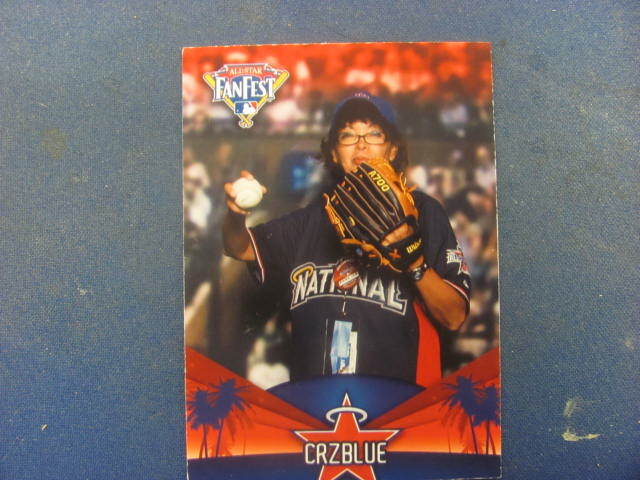 When I was at the FanFest, we got in line to get our baseball cards. They had different jerseys you could put on to pose for the picture. Brother Vic posed with a Rays jersey. He is a Rays fan in addition to being a Dodger fan. We teased him afterwards that we had traded him to Tampa for Evan Longoria. You know the first youtube video I recorded of Kenley Jansen that I put in my prior post? Well, last night I noticed that it has over 5,000 views! Unbelievable! Oh, I just got an email from Matt from http://pittpeas.mlblog.com that I am being featured in the MLB blog front page! Wow! Thank you Matt for alerting me! And thank you MLBlogs!! Your brother could always get a job as a double for Dioner Navarro, our exiled catcher, and also a former Boy in Blue. Glad to see someone in the Azule clan respects the Rays blue too. You are going to love watching “Pods” play ball. He is one of those scrappy player who makes pitchers itch when he is on base. He plays an aggressive style on the basepaths and should cause a mess of trouble (good) for the Dodgers. Hey Emm….Billy Loes, pitcher, Brooklyn, passed away. 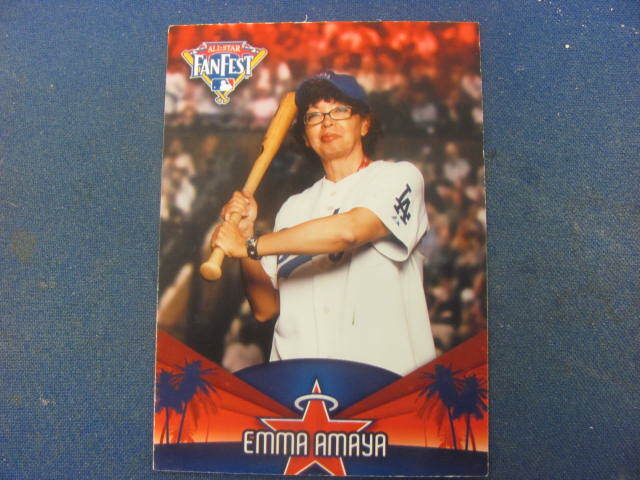 Love your “baseball cards,” Emma! You look great! And congrats on getting Scott Posednik. He really impressed me during the series the Yankees just had against the Royals. What a spark plug. Emma: Omg I love those pics! 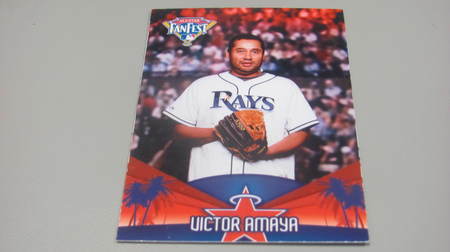 You look mighty fine on a baseball card! I think the Scott Podsednik trade is really going to help the Dodgers. Scottie Pod absolutely KILLED my Yankees last week. He’s a great player who has the ability to spark the offense with his speed. I hope he does well for you. I told my brother what you said that he looks like Dioner. Some friends say he looks like Padilla but Vic is better looking! Vic has been a Rays fans since the team came into existence. I know 😦 rest in peace Billy Loes. I updated my post of the Brooklyn Dodgers living a few days ago. We lost two this month so sadly we are now down to 59. Still an amazing number. Thanks Jane! Looking forward to seeing Pods when the Dodgers come back from SF. I got a surprise next week too that I’ll share aferwards. Thanks D! we had lots of fun gettin our baseball cards. Viriginia, Thanks! Glad to be hearing good thins about Pods! Esta serie se quedó en casa, para bien de los Padres, pero la lucha continúa. Aunque este año tengo el presentimiento de que será nuestro gran año (espero). Por cierto, si “envidia” tenías por el tren que iba a San Diego, imagínate tú la que tengo yo, que vivo a 6.000 millas del PETCO Park. Felicidades por estar en la portada del MLBBlogs.com. Me alegra ver que hay fanaticos del beisbol en todas partes. Y felicidades en la copa mundial. Gracias por las felicitatciones! Thanks Jenn! You know I am surprised to find out that some fans that went to the FanFest did know they could do that. Thanks Peter! Trading cards? I am not trading myself. The Dodgers are stuck with me! lol. Emma! FRONT PAGE NEWS! Totally cool! I hope the Dodgers deal Manny. I like the guy but they need some prospects. Wouldn’t mind them dealing Billingsley, Martin, and Kemp too. Thanks! Lots of request for the Dodgers, Angels, Yankees and Red Sox but I did see fans asking for other jerseys. I like what everyone is saying about Posednik. Just wish our boys will start hitting and our bully start doing a better job. Imagine my surprise when I saw me on the front page! I read in the LA Times that they did not want to part with Billz in the Oswald trade so I don’t know. Dodger hitters are way better when Manny is in the lineup.